There are some animated characters that stay with you all your life. I was never much of a Mickey Mouse fan. 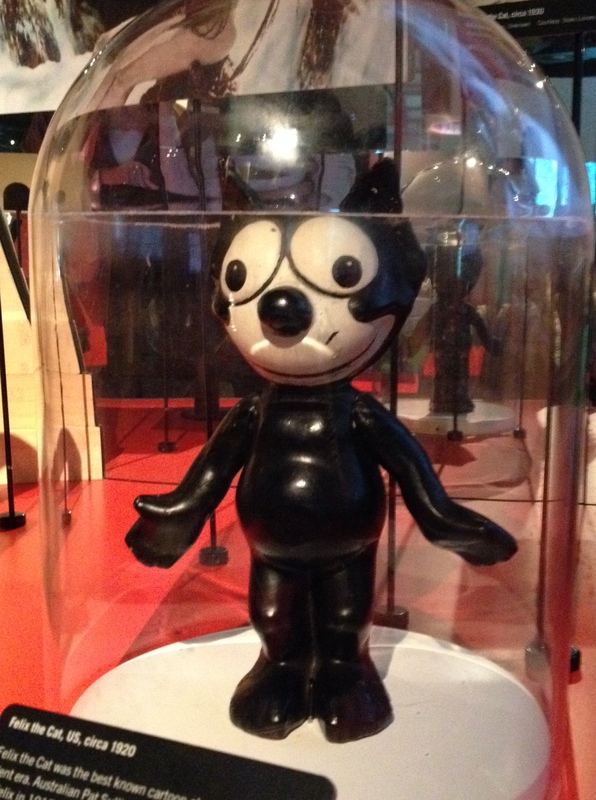 My favourite character was always Felix the Cat. The cartoons were very old when I was a child, being made in the 1920s, long before even my mother was born, but great animation always remains so. The song was what got me, too, and the idea of having a bag of tricks that you could reach into whenever you got “in a fix”. I went to the Australian Centre for the Moving Image (ACMI) at Melbourne’s Federation Square recently. Having an interest in the history of film and TV, I kept meaning to go, and never quite got there. Fortuitously, this outing was part of a class trip I had to take some students on. ACM’s permanent exhibition, Screen Worlds, is free, and it is packed with films, sound, interactive opportunities and memorabilia. How delighted I was to come across this little fella, then. Yes, it’s Felix, and it reminded me that it was an Australian cartoonist and silent film maker, Pat Sullivan, who was one of the originators of Felix. This is controversial: although Sullivan (c1887-1933) was the owner of the character and the producer, he always said he had originated Felix. US critics have usually credited his American employee, Otto Messmer as the original animator, but an Australian Broadcasting Corporation show, Rewind, in 2004 seems to have confirmed Sullivan as the originator. Whatever, Messmer and Sullivan drew the comic strip, which started in 1923, with another American animator, Joe Oriolo, later replacing Messmer. It was Oriolo who gave Felix his famous bag of tricks. Felix started out as a character in the silent film short Feline Follies (1919), before being adapted for print and syndicated in hundreds of newspapers. He was around long before Walt Disney created Mickey Mouse. Ironically, a mouse often being the target of a cat, it was the popularity of Mickey Mouse that led to Felix’s demise in the 1930s, before he was reinvigorated by Oriolo for US TV in the 1950s and given that magic bag of tricks. Some trivia: the original voice of Felix in the 1930s was performed by Mae Kwestel (1908-1998), who also did the voices of Betty Boop and Olive Oyl. She appears to be the only woman to have voiced Felix, with at least eight male actors to have played Felix over the decades. Interestingly, DreamWorks Animation acquired the rights to the character this month (June 2014), with CEO Jeffrey Katzenberg quoted as saying his company will make Felix into ‘one of the most desired fashion brands in the world.” Oh no! I was hoping for a new Felix cartoon series also starring Felix’s nephews Inky and Winky. For the record, Felix the Cat was ranked number 28 in TV Guide’s list of the “50 greatest cartoon characters of all time” in 2002. Well, Felix is still number one for me.